ARS microbiologist Mark Jackson examines a fungal culture being produced for a biopesticide against silverleaf whitefly. (Keith Weller, K9512-2). Microbiologist Mark Jackson (left) and Brazilian collaborators, seed physiologist Nilce Kobori (center) and entomologist Gabriel Mascarin (right), discuss the progress of their fermentor run on the production of the biocontrol fungus Trichoderma. (Nilce Naomi Kobori, D3409-1). Technological advances by Agricultural Research Service scientists are continuing to improve the way beneficial fungi are formulated for use as biopesticides. 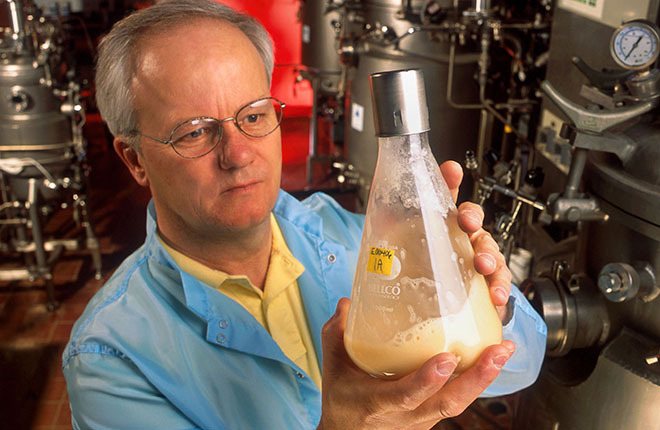 More than a decade ago, ARS microbiologist Mark Jackson and colleagues successfully demonstrated the use of liquid culture fermentation (LCF) in mass-producing spores of the fungus Isaria fumosorosea, which infects whiteflies, root weevils, psyllids, and other insect pests. They’ve also developed liquid culture methods for producing resting structures, called “microsclerotia,” of two biocontrol fungi: Mycoleptodiscus terrestris, which infects aquatic weeds such as hydrilla and Eurasian water milfoil; and Metarhizium brunneum, which infects and kills beetle grubs, wireworm, and corn root worms. Studies have shown that microsclerotia are especially durable, long-lasting during storage, and effective as bioinsecticides and bioherbicides.Microsclerotia can be applied to soil, grass, or weedy plants and produce infective spores when environmental conditions are right. In 2014, the researchers added two more commonly used fungal biocontrol agents to their list of LCF successes: Beauveria bassiana, which targets aphids, thrips, and whiteflies, and Trichoderma harzianum, whichhas been used to control plant diseases and enhance overall plant health. Traditionally, biopesticide makers have cultured Trichoderma and Beauveria on moistened grains, such as rice, or other solid substrates, coaxing them into forming specialized spores called “conidia.” The conidia are then harvested and formulated into biopesticide products that can be applied to field- or greenhouse-grown crops as alternatives to synthetic chemical pesticides. Over the past decade, Jackson and colleagues at ARS’s National Center for Agricultural Utilization Research in Peoria, Illinois, and elsewhere have experimented with LCF methods to produce stable, effective spore forms called “blastospores,” as well as microsclerotia. LCF has proven economical to use, yielding blastospores or microsclerotia in 2-3 days versus 10-14 days for conidia using traditional solid-substrate culture methods, says Jackson. Replacing expensive nitrogen sources such as hydrolyzed casein with low-cost cottonseed flour has reduced production media costs by 80-90 percent, he adds. 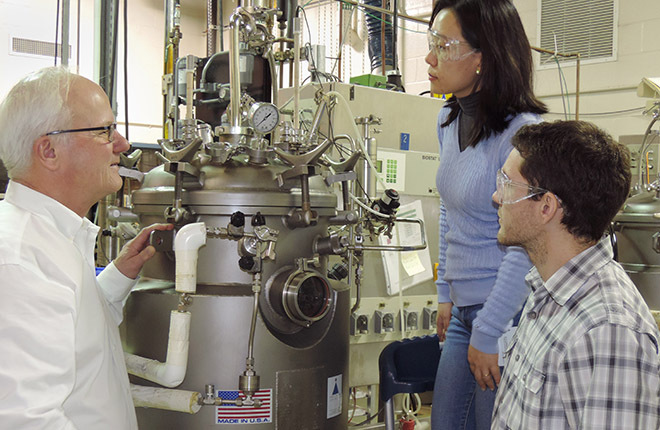 Two visiting Brazilian scientists—Gabriel Mascarin, an employee with the Brazilian Corporation of Agricultural Research (EMBRAPA), and Nilce Kobori, a National Council for Scientific and Technological Development research fellow—collaborated with Jackson to investigate the use of LCF for the cost-effective production of the spores of U.S. and Brazilian strains of Beauveria, Isaria, and Trichoderma. The researchers discovered that they could produce stable, effective blastospores of Beauveria and Isaria in 2 to 3 days under appropriate LCF conditions with cottonseed flour medium. In addition, the Beauveria blastospores killed silverleaf whitefly nymphs25 percent faster and with just one-fourth the number of spores than conidia produced with current commercial production methods. Their studies also demonstrated, for the first time, that under appropriate LCF conditions, Trichoderma can form microsclerotia suitable for use as a seed coating or soil-incorporated granules. Patent applications have been submitted for both LCF technologies, and Jackson is actively seeking commercial partners.—By Jan Suszkiw, Agricultural Research Service Information Staff. “Formulating Fungal Biopesticides” was published in the April 2015 issue of AgResearch Magazine. Beauveria bassiani fungi can control aphids. Trichoderma harzianum fungi can control diseases. Liquid culture fermentation useful for mass production. Stable, effective forms of each biocontrol developed. Production time and costs reduced.